Charleston, W. Va„ Mar. 21 —The ravaging Ohio river rolled on south today, leaving in its wake thousands of West Virginians homeless, at least 17 dead and uncounted millions of dollars property damage. Scores of cities and hamlets were inundated; exhausted rescue and relief workers in boats peered through the second windows of houses seeking stranded persons; houses, haystacks and livestock floated down the swollen river. At 8 a. m. Huntington officials said the torrent was almost at its crest, 3.3 above flood level, and only suburban Westmoreland and Guyandotte inundated. The water crept up near the business district of the state's largest city but relief workers looked for little further damage. There were 2,500 already out of their* homes. Parkersburg, 89 miles up the river, had 47 feet today, compared with the crest of 48.4 and a flood level of 40. The water was dropping. The residential section called riverside and part of the business district were flooded. There was no loss of life. Police estimated 2,500 are homeless. tween Huntington and Parkersburg, there were 600 homeless. Water still flowed in some streets of Wheeling, where the greatest property damage was done and the most lives lost. One official estimated damage in the Wheeling metropolitan area at $2,500,000. 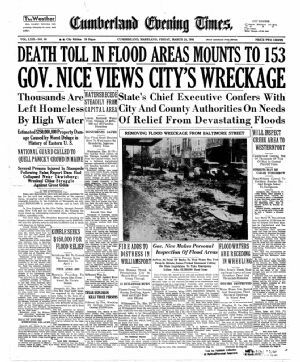 On Wheeling Island, where 10,000 persons reside, it was impossible to tell yet how many houses were washed away and how many crushed by the force of the flood. Governor H. G. Kump asked for surveys of needs in flood districts to repair damage. Seventy tons of food from warehouses of the relief administration, and diphtheria and smallpox vaccines were rushed to health department officials.